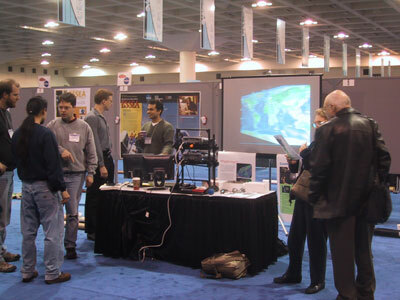 Wiggleview was exhibited at the American Geophysical Union meeting held in San Francisco, Dec 6-10 2002. An abstract was submitted and accepted for a poster session on Dec 7, 2002. 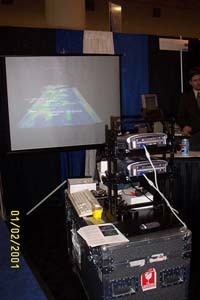 The IRIS booth was home to EVL's AGAVE for the rest of the conference. Data was retrieved from the IRIS network in real-time and displayed on a sphere and on a flat map in real-time. Users could query the IRIS Bud server in Seattle, Washington and see data for a certain time period. Data downloaded for past events like the Izmut earthquake and the Anza Halloween earthquake was also loaded up. Here is an electronic copy of the flyer handed out at AGU. It was created by Laura Wolf and Julietta Aguilera at EVL.